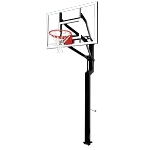 Made Entirely in the U. S. A.
Goalsetter Basketball Hoops - Contender 54 inch Tempered Glass - Internal Height Adjustment. Shipping Included in the price when shipped to the contiguous 48 states. The Contender model is part of the Signature Series from Goalsetter. The system features a 54 in. tempered glass backboard. It has a 1-piece, 4x4 inch square offset steel pole. This model uses the internal height adjustment mechanism to adjust the height of the rim on the system from 6 Ft. to 10 Ft. with infinite increments in between. The internal mechanism means the component parts are enclosed in the pole of the system to protect it from the elements. The pole anchors to the ground using a wedge ground anchor. 54 in. x 36 in. Tempered Glass Backboard measures 3/8" thick. 1 1/2 inch Steel Backboard Frame. Strength Increasing 1/4" Thick Steel Plate for Rim Mounting. Glass backboards provide a better rebound when compared to acrylic. 4x4 inch square pole with an offset design for even weight distribution of the system. Pole anchors into the ground using a wedge anchor. 2.5 Ft. of clearance between the pole and the backboard. Internal height adjustment mechanism allows for rim heights from 6 Ft. to 10 Ft.
An internal mechanism refers to the component parts being enclosed inside the pole to protect them from the elements. Height adjusts using a turn crank that comes at about waist height on an adult. Product weight about 345 lbs. Product ships from Iowa via an LTL freight carrier. Typically leaves the warehouse within 2 business days and spends 3-6 business days in transit. Choice of 4 different rims. Easy product assembly using Goalsetter's patented hinge-system, which allows complete assembly of the product before raising the system into its final upright position. Ideal for institutional use where dunking is discouraged. The non-breakaway style makes dunking and hanging less comfortable as it does not give up or down. Competitive Edge Products, Inc. is an authorized dealer of Goalsetter Basketball Hoops. If you find the Contender 54 inch Glass backboard Internal height adjustment system for cheaper anywhere else online, please let us know. We will try to match or beat their advertised pricing (price of the product + shipping costs). The Contender is a strong hoop that is built to last. It is very durable and is really cool looking also! "I appreciated the ease of installation and the apparent strength o f the system! I am looking forward to a lifetime of hoops with Goalsetter! Everything was ""Made in America""! " "The things I like most about my Contender system: The ease of installation, the ease of adjusting height, and the durability (heavy duty). " We love the adjustable height and how sturdy the entire hoop is. This is a great system! Q: How easy is it to adjust this hoop can kids do it? Fast Shipping: Orders for the Goalsetter SSCOGI generally leave the warehouse within 2-4 business days. Dimensions: 54" x 30" x 30"